Buying those large, economical large of onions always seems tempting, but what if you're a small household? Freeze them! CrypticCRICKET shows you how to freeze both chopped onions and sliced onion rings for longer storage when you've got too many onions on your hand. 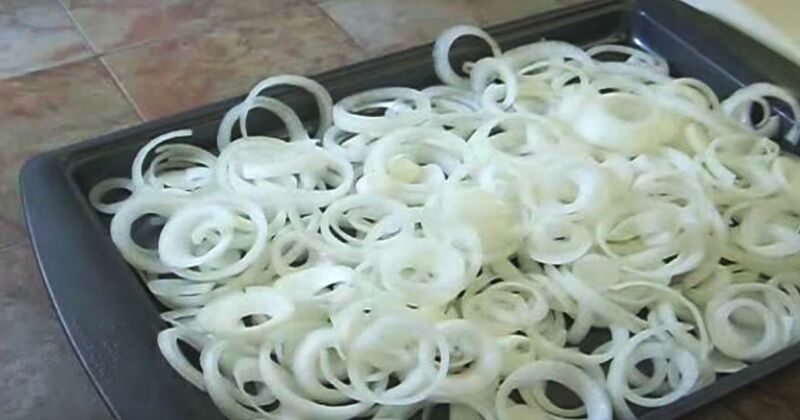 One trick of note from the video is that onion slices should be frozen before bagging. This allows you to spread out the rings in an even layer on a baking sheet so that you don't have large chunks or "bricks" of onions when placing them together in a freezer bag. If you have just a few onions or ones you might need sooner than those frozen for storage, America's Test Kitchen urges you to keep air circulation in mind. A cool, dry and dark storage area works best. However, the need for proper air circulation should discourage you from shoving them into a drawer or cabinet. Think instead about hanging wired baskets in a dry part of your basement or garage. Remember not to overcrowd the root vegetables during storage. The Washington Post even suggests hanging storage of onions in old nylons, placing a knot around each onion to reduce crowding. And while this environment is also preferable for storing potatoes, resist the urge to store these two together. Gasses emitted from the onions can cause a greening of potato flesh, which will need to be cut off and discarded before use. Pass along these tips to extend the life of onions to your favorite cook.